Chris Browne, cartoonist of “Hägar the Horrible” and author and illustrator of the children’s book “The Monster Who Ate the State,” has received the Sioux Falls Arts Council’s 2016 Mayor’s Award for Individual Excellence in Literary Arts. The South Dakota State Historical Society published the book, which features sites throughout the state, including Falls Park, the State Theater and the Great Plains Zoo in Sioux Falls. Born in South Orange, N.J., Chris Browne brings the prehistoric Soozy to life as he regales readers with her adventures and describes the unique places she visits in the Mount Rushmore State. Browne now lives in Sioux Falls with his wife, Carroll. In addition to being the syndicated cartoonist behind “Hägar the Horrible,” he is an artist whose works can be found all over the world. 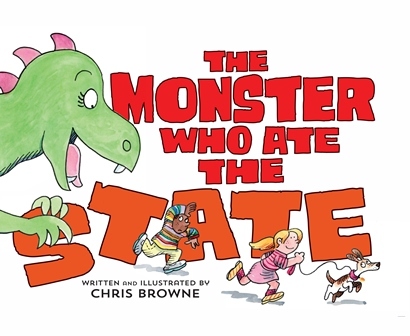 “The Monster Who Ate the State” is suitable for first- to fourth-grade readers or as a book to be read aloud to younger children. Readers can purchase the book for $19.95 directly from the South Dakota Historical Society Press by visiting www.sdhspress.com or calling (605) 773-6009.